I admit it, I am totally a (historical) royals geek. Of course, I understand that royalty are just people, some of whom aren’t very interesting or nice. But especially when I was younger, I read numerous “Queens of England” books and biographies of various queens. I always think about doing social media theme days with images of different queens, then get disappointed when I realize that there aren’t enough movies/TV series to make it worthwhile. I did the English queens in three posts, now I have to do the French! I’m mostly working with Wikipedia data here, so if you know of a movie or TV series that has included any French queens, please feel free to add it in the comments! If they’re not listed here, it’s because I can’t find any onscreen portrayals. Also, I don’t wanna hear any bitching about the term “lesser.” I mean “less frequently depicted.” Breathe. A Thuringian princess, she was one of six wives of Clotaire I, king of the Franks. She founded the Abbey of the Holy Cross at Poitiers. Marisa Berenson (from Barry Lyndon) in L’Enfant des loups (1991). She looks like a Robert Palmer girl. Born into a low-ranking family but married Chilperic I, the Merovingian Frankish king of Soissons. She has a bad reputation (deserved?) and was “put aside” for another woman by her husband, but after his death served as regent for her son from 584-97. Fredegonde, before 10th c., via Wikimedia Commons. So instead, I offer this idea of what we’re working with. Is it a Sweet Valley High production? The daughter of Count Gerold of Kraichgau, she was the second wife of Charlemagne. Illustrations from the Nuremberg Chronicle, by Hartmann Schedel (1440-1514), Beloit College. 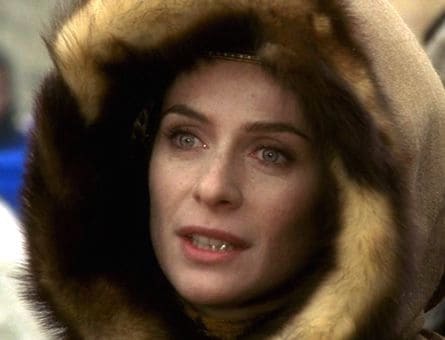 Magali Renoir in The Young Man and the Lion (1976). Looks like many an SCA queen. 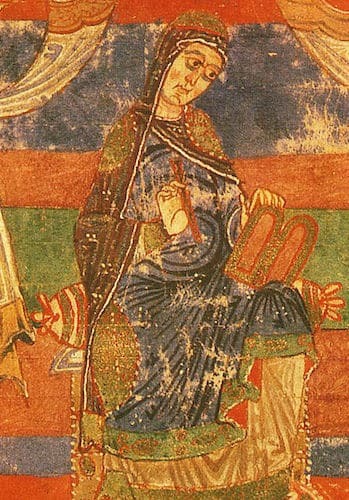 Daughter of Yaroslav the Wise, Grand Prince of Kiev, she married Henry I. She served as regent for her son from 1060-65, and founded St. Vincent Abbey in Senlis. I can’t find an even vaguely-contemporary image of the real deal! 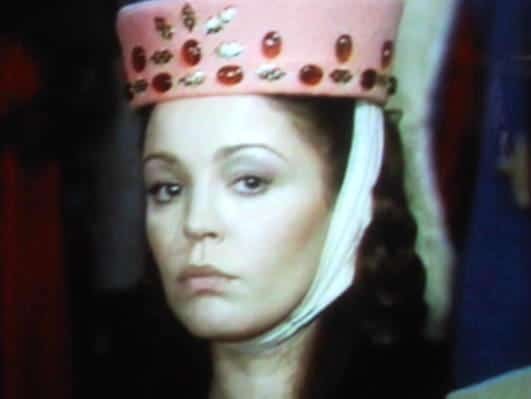 Elena Koreneva in Ярославна, королева Франции aka Yaroslavna, reine de France (1978). Ah the gamin bang trend of the 1000s! Daughter of Alfonso VIII, King of Castile, she married Louis VIII. She was involved in politics and organized armies in support of her husband multiple times. She served as regent for her son during his minority (1226-34) and again when he was on Crusade (1248-52). Psalter of Blanche of Castile, between 1225-35, Bibliotheque nationale de France. 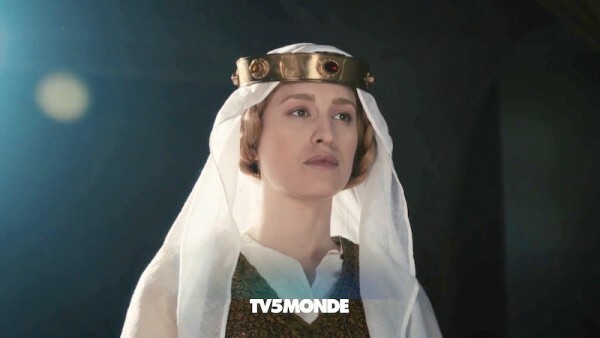 Julia Mugnier in an episode of the TV show Secrets d’histoire called “Blanche de Castille, la reine-mère a du caractère” (2018). Hard to see much detail, but I like the hair! Daughter of Ramon Berenguer IV, Count of Provence, she married Louis IX. Her sisters were also queens: Eleanor of England, Sanchia of Germany, and Beatrice of Sicily. She joined her husband on crusade and was very politically active. 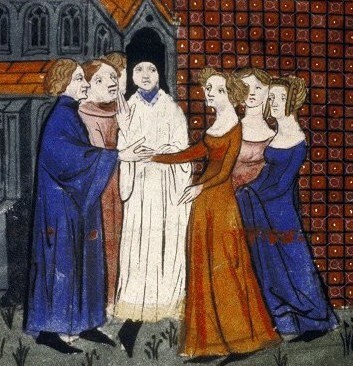 Guillaume de Saint-Pathus, The marriage of Louis IX and Marguerite of Provence, Vie et miracles de saint Louis, c. 1330-40, Bibliotheque nationale de France. Katherine Watteau in La Chronique des siècles: La Complainte de Jérusalem (1970). I don’t know what she’s complaining about, she clearly got to wear all the blue eyeshadow she requested. Daughter of Robert II, Duke of Burgundy, she married Louis X of France and I of Navarre. She was caught up in a scandal when she and her sisters-in-law were accused of committing adultery in the “Tour de Nesle affair,” and she spent the last two years of her life in prison. I can’t find an even vaguely-contemporary image of the real deal! Maybe because she was considered a hoooor? Silvana Pampanini in La Tour de Nesle (1955). Muriel Baptiste in Les Rois maudits (1972). A production that SUPER HEARTS hot-glued-on plastic gems. Helene Fillieres in Les Rois maudits (2005). REALLY can’t see much here, I had to scour to even find this. She was the daughter of Charles Martel of Anjou, the titular King of Hungary, although she was born and grew up in Naples. She was the second wife of Louis X of France/I of Navarre, who died shortly after their marriage while she was pregnant (the baby died). She continued to be active in royal life in Paris thereafter. 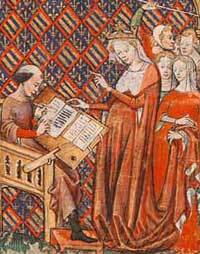 Wedding of Louis X of France and Clemance Hongrie, Grandes Chroniques de France, 14th c., Bodleian Library, Oxford Univ. 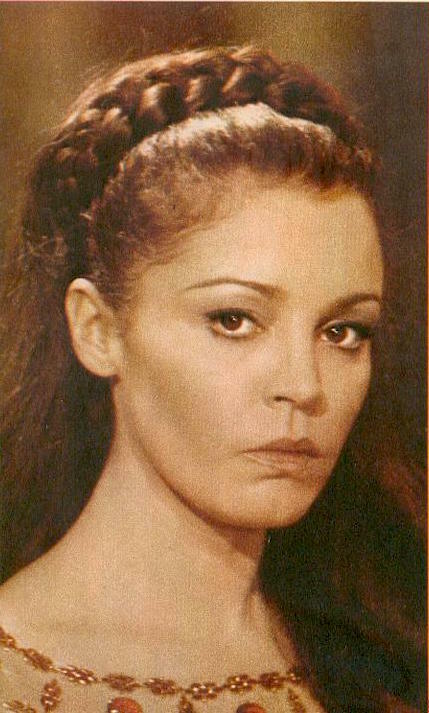 Monique Lejeune in Les Rois maudits (1972). WHAT IS WITH THIS PRODUCTION AND BEIGE??!! 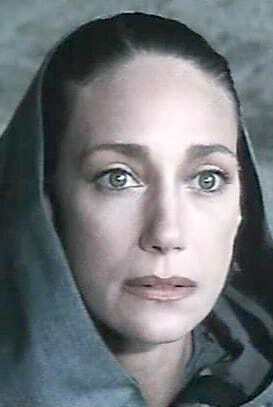 Serena Autieri in Les Rois maudits (2005). She’s a furry? She was the daughter of Otto IV, Count of Burgundy, and Mahaut, Countess of Artois. She married Philip V and ruled as Countess of Burgundy and Countess of Artois. She was implicated as possibly knowing about the adultery that happened in the “Tour de Nesle affair” and was imprisoned as a result, but eventually her name was cleared. Joan II, Countess of Burgundy, Queen of France and Navarre, from “Breviculum seu electorium parvum” of Thomas le Myésier, Karlsruhe, Badische Landesbibliothek, c. 1325. 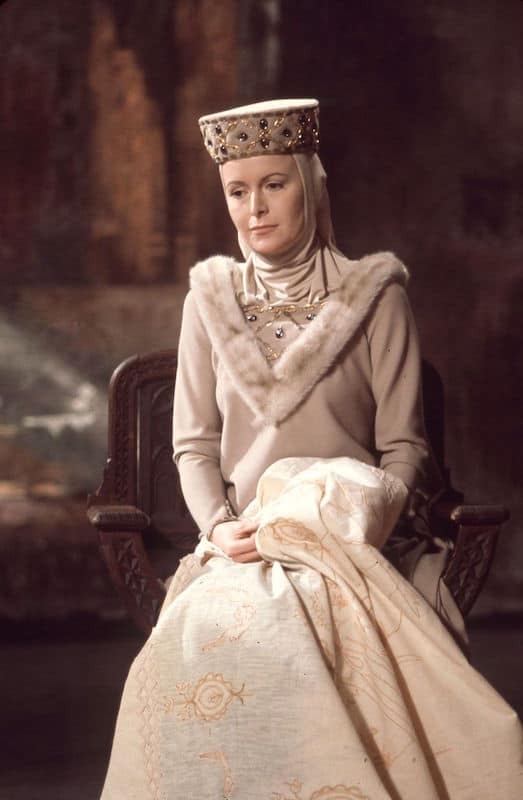 Catherine Rich in Les Rois maudits (1972). See? Plastic gems and hot glue! 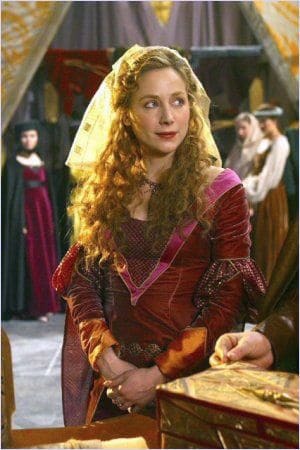 Julie Depardieu (daughter of Gérard) in Les Rois maudits (2005). I guess it’s medieval-oid? Sister of Joan II of Burgundy, she was the daughter of Otto IV, Count of Burgundy. She married the future Charles IV, and was yet another accused of adultery in the “Tour de Nesle affair.” She was imprisoned until her death. Yet another for whom I can’t find an even vaguely-contemporary image of the real deal – again, maybe because of potential hoor-dom. Uschi Glas in La Tour de Nesle (1968). I’m not bad, I’m just drawn this way? 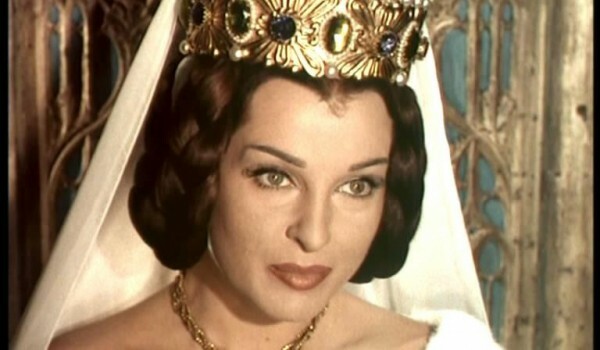 Catherine Hubeau in Les Rois maudits (1972). Somebody got distracted mid-braiding. 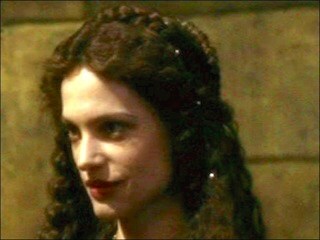 She was played by Anne Malraux in Les Rois maudits (2005), but I can’t find any images. Daughter of Robert II, Duke of Burgundy, she married Philip IV; she had some kind of limp, hence the nickname. She served as regent while her husband fought on campaign, and was a scholar. Jeanne de Bourgogne and Jean de Vignay, 13th century, via Wikimedia Commons. 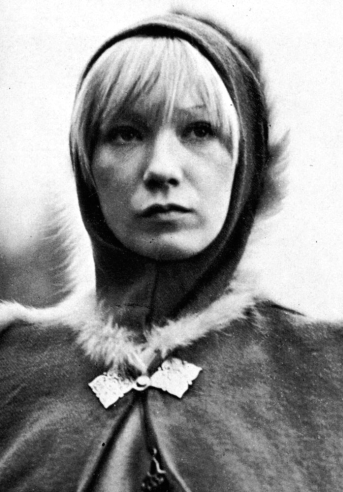 Ghislaine Porret in Les Rois maudits (1972). SEE? BEIGE!!! 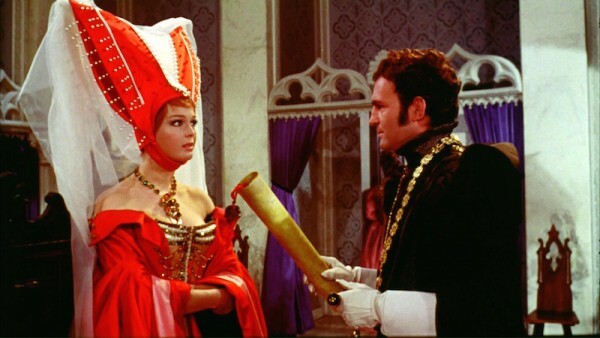 She was played by Claude Gensac in Gaston Phébus, le Lion des Pyrénées (1978), but I can’t find any pics. Tune in next week for the second half of my French queens run-down! I’m not as knowledgeable about French queens as I am EmgliEn but I know the Merovingian ladies were colorful in the extreme ranging from saints to she wolves. Also beige was not a favored royal color. 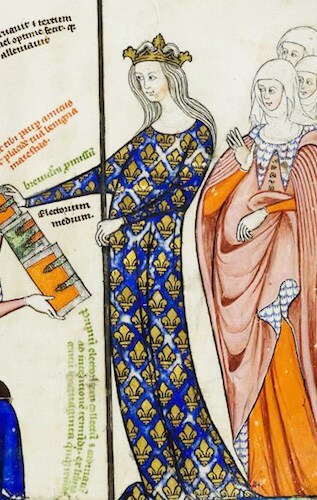 Different note, I wonder why medieval books so often feature women standing so curved. I mean, I’m down with an era where maybe having a bit of a belly rounding out is popular, but I have a hard time imagining that being the common way of standing. yes, I remember seeing it, too! very interesting! I favor Charlemagne’s second wife bc I remember seeing a French production on the life of Charlemagne with heavy photos of the Aachen baths but cannot find it again. Help? 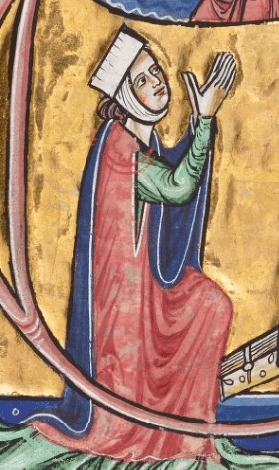 Also Saint Louis’s mother Blanche of Castile was formidable and deserves more screentime due to a granddaughter of great-granddaughter of Eleanor of Aquitaine. The 2005 version of “Les Rois Maudits” has the worst interpretation of history. The costumes are worst than Reign, and the decors look like they were borrowed from German Expressionism movies of the 1920s. The outfits they dressed Jeanne Morreau in are from the 1980s. Seriously, I watched the whole mini-series and my eyes were bleeding. I’ve only seen pics and I may never recover. 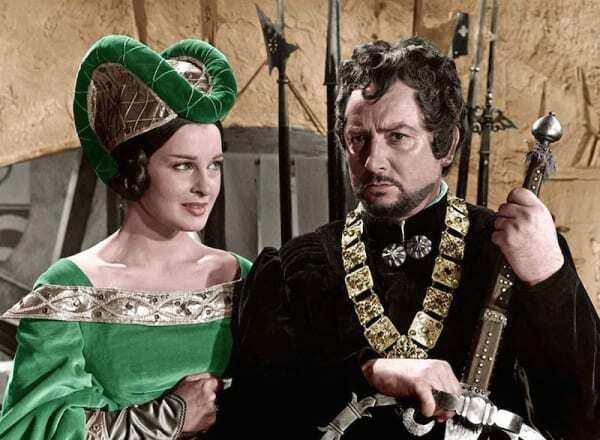 Les Rois Maudit is based on a series of novels (7 books) known as The Accursed Kings by Maurice Druon. I highly recommend the whole set — the history is accurate. They are hard to find here in the US, but worth the search. If there are DVDs of the miniseries, I may pick up a copy. 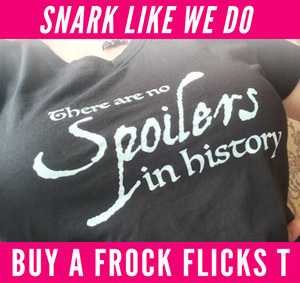 George RR Martin of Game of Thrones fame, which you may have heard of, cites The Rois Maudit as one of his inspirations for his series, with all the treachery and blood feuds and many, many dynamic female characters who were powerbrokers in their own rights. Blanche of Castile is not a lesser queen. 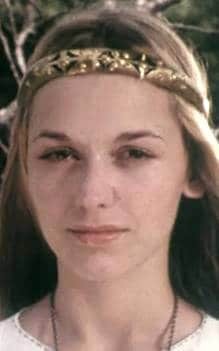 She’s quite proeminent among the French medieval queens, because she is grand-daughter of Eleanor of Aquitaine, she acted twice as regent for his son ( Louis IX), one of the greatest French kings in Middle Ages and a saint. She deserved a movie for herself, but she’s a woman and not a “scandalous one”, but a very clever politician and a devout mother. Also, I don’t wanna hear any bitching about the term “lesser.” I mean “less frequently depicted.” Breathe. Blanche definitely took after grandma. 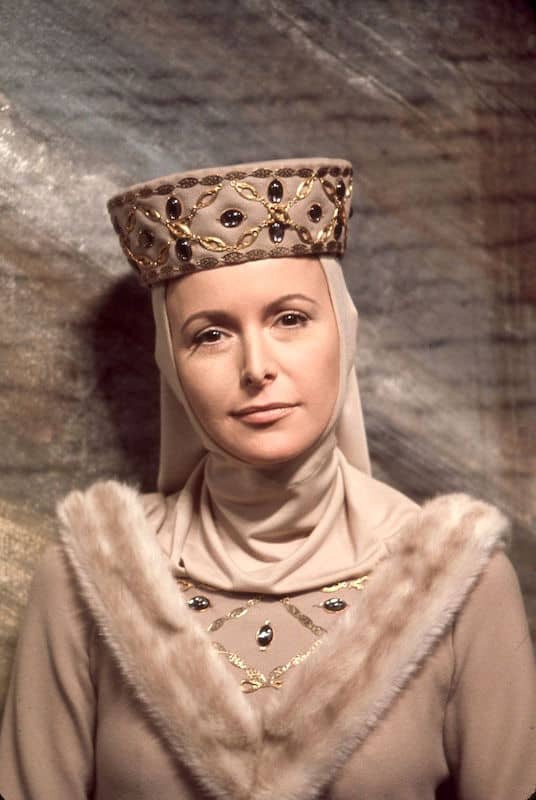 She was a very effective regent and the mother in law from hell. The first six are my ancestors. I need to start watching. Lolz in the 1970s they had to take the time to stick those plastic flatbacks onto them upside down pet bowl hat things with Aleenes Tacky! Not hot glue guns for a few years yet! Oh the commitment!! 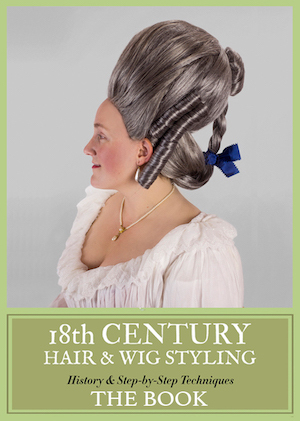 Oh, my, that eye shadow on some of the ladies–and the anachronistic eyebrows! 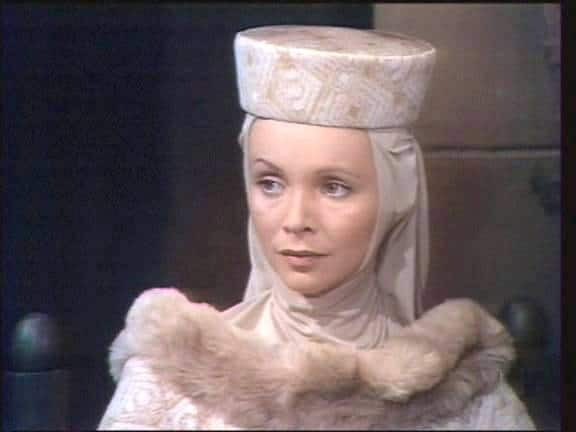 However, I do find Marisa Berenson has a good medieval look (so did Anjelica Houston in one of her early movies), even though her acting range is limited. 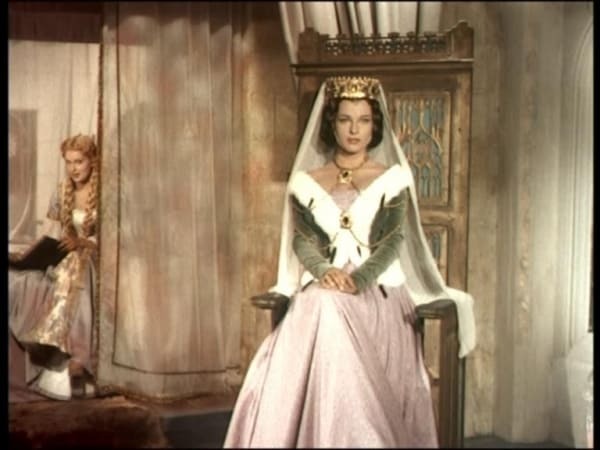 Hildegarde is also depicted in “Charlemagne, le prince a cheval” (1993), and king’s mother Queen Berthe also features prominently. 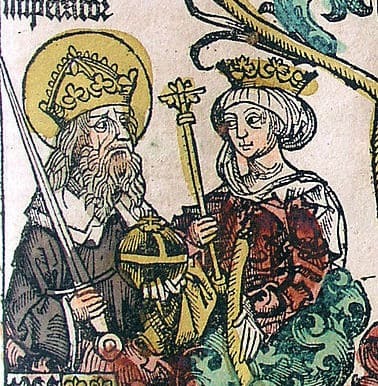 I remember there is also smaller role for Charlemagne’s last wife Queen Liutberga. As for the Anne of Kiev, there is alleged mural portrait of her with sisters from Kiev cathedral https://uk.wikipedia.org/wiki/%D0%90%D0%BD%D0%BD%D0%B0_%D0%AF%D1%80%D0%BE%D1%81%D0%BB%D0%B0%D0%B2%D0%BD%D0%B0#/media/File:Princely_group_portrait.South_wall_of_the_nave.-_Google_Art_Project.jpg (hope that is embedded correctly). She must be the first or second, as she was the eldest. There is also another film of her in the works, joint French-Ukrainian production. But it’s been filmed for several years now, and even if it comes out it is bound to be a spectacular trash, judging by a single poster with Anne in beige sleeveless I-am-kinda-roman-empress dress. Wasn’t there a Charlemagne mini-series at some point that featured several of his wives? St. Radegunda had a sister-in-law named Ultragotha, really, Ultragotha! As near as I can tell from Wikipedia King Clotaire I’s six wives were at least as interesting as Henry VIII’s – but much less well documented. Apparently at least three of them were living in his household at the same time. 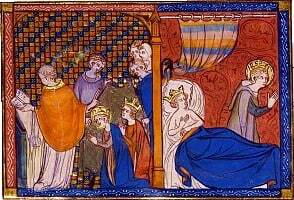 The Merovingians didn’t give up polygyny when they converted to Christianity. Ultragotha should totally have been my goth Wonder Woman superheroine pastiche. 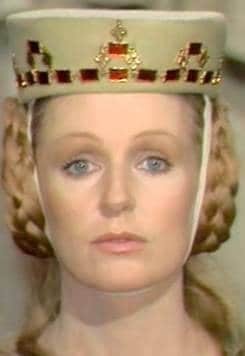 I would choose Josine van Dalsum in “De leeuw van Vlaanderen” as Jeanne de Navarre (1985). Perfect evil, only looking for more power and smashing nice young women… The costumes are mostly strange, although some scenes from the French court are looking as taken fout of Medieval books. I don’t know an English version, but you could maybe find the original film on YouTube.